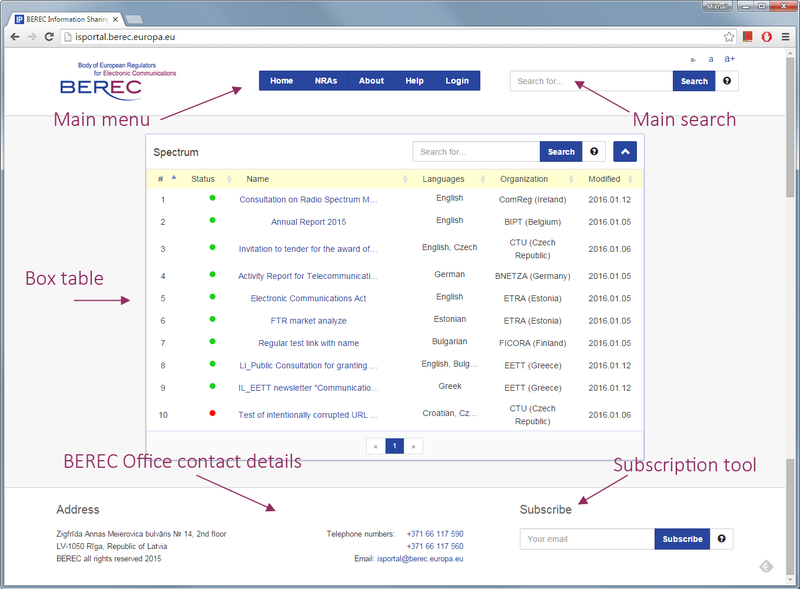 This page provides guidelines to general users on how to work with the BEREC Information Sharing Portal (IS Portal). The IS Portal aims to provide a single point of access to information provided by National Regulatory Authorities (NRAs) of BEREC and to allow users to search across related documents and news. More information on the portal can be found on About page. The ‘Home’ page features several Box-tables containing specific items selected by the BEREC Office. These items contain links to documents or news as well as some metadata. Users can perform a simple or advanced search of specific documents or information resources on a particular topic by using the Search tool placed at the top of the ‘Home’ page. Search results are presented in the form of a Box-table. Each Box-table contains a list of items found (table rows) and basic document properties (table columns). 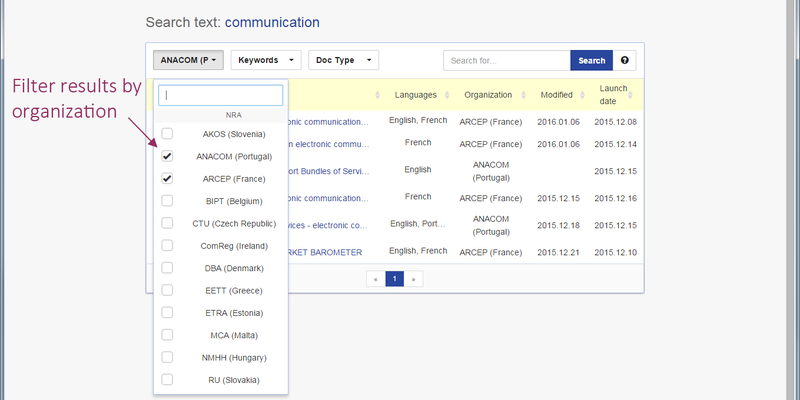 Users can filter search results by NRA Organization, keywords, and document type. Users can access the main navigation menu (Main menu) from any page of the IS Portal. The Main menu provides access to all the components of the website: information on NRA organizations, About IS Portal, Help, and login for NRA and BEREC administrators. Users can use a subscription tool to subscribe to all new items sent electronically on a monthly basis. General inquiries and technical problems can be reported via BEREC Office contact details on the bottom of the ‘Home’ page. 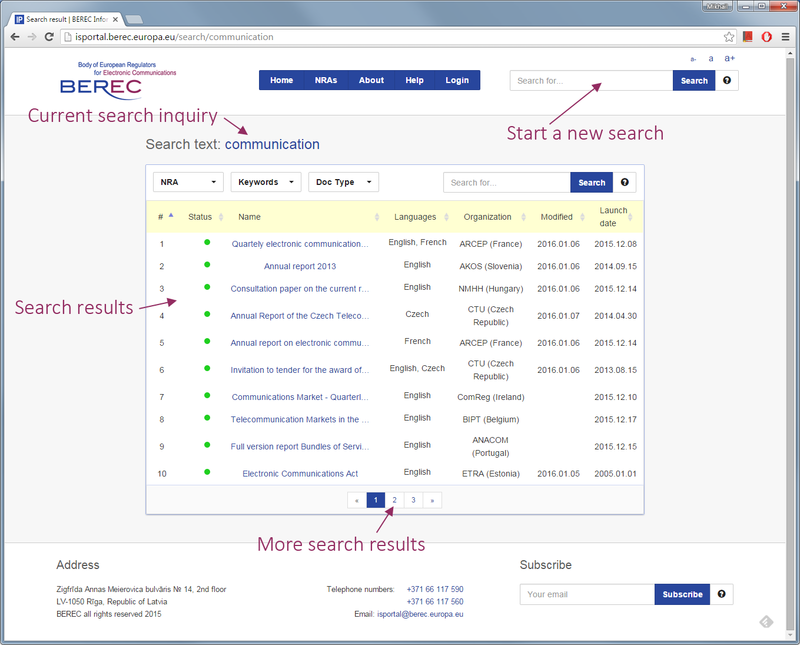 A Box-table with contains Search results – a list of items matching the search criteria, which were found on the IS Portal. If a search inquiry returns more than 10 items, search results will be displayed on several pages. The current search inquiry is displayed above the Box-table containing the search results. The main search bar is placed at the top of the page to enable users to start a new search at any time. The Main search bar allows to see Instant results as you type. Perform an advanced search of the obtained results presented inside the Box-table. The results can be sorted accordingly by clicking on the column headings (yellow bar). Users can narrow down the obtained search results by applying one of the following Filters. For any questions or technical problems, please contact our helpdesk at isportal@berec.europa.eu.